Twenty grannies done, twenty-eight to go, though it's all on hold for a bit as I finish up some commissioned patterns that are due . . . pronto. I have so many things going on backstage, most of which involve other peoples' projects, so I must be coy. Making grannies is my little end-of-the-day treat. The Bee is irritated that I've moved all the squares to the table, so she's defected to our bedroom, and kicked Violet off of the ripple blankie. The cats can't be on the same blanket at the same time, and at some point last week, Bridget, perched next to a pinned-down granny in the guest room, just said, "Hey, what's my problem. There's a perfectly good finished blanket over there. See ya, sap," and booted Vi off with a hiss and a swat. Sometimes I think my greatest incentive in finishing a square is getting to go upstairs and block it. I am blocking all squares as I finish them, because blocking absolutely transforms these babies from slightly fraught, tweaked-out, anxious little trapezoids to drapey, blissed-out grown-ups — they're all mature and perfectly square and presentable after spa-treatment. To achieve that end, simply pin them out (with stainless-steel pins, so they don't rust when wet) into eight-inch squares using a tape measure. Be sure to add three or four pins per side, and tack down more than just the corners. (I use the guest bed because the mattress is old and the quilts on it are hard-working old dogs that can take a sprinkle or two, but I know that people have used towels or padded boards to do this. Just use whatever flat, water-and-pin-friendly surface you have.) Then, spray it all with a water bottle until it's nice and saturated. Then leave it to dry completely, and when you return to unpin and lift you'll see how addictive this whole process is. I always get very psyched when I hear that someone hasn't ever blocked their work before because I know they will be so pleased with the transformation. Are there any other tips on blocking I should know about? I know there are a few ways to do it, but this is what I've always done. I plan to block the seams after I crochet all the squares together, as well. I can't wait. I think I'm going to repaint the guest room to go with this blanket when I'm done. Maybe blue, like the blue in that white-blue-pink-red square. Hydrangea blue. A granny flower. This is coming along so beautifully! Love the blankie! I've started my own granny blankie. 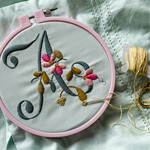 Circular lace should be blocked on a perfect circle cut out of paper. So couldn't granny squares be blocked on paper square cut outs so you don't have to measure every single block? Thank you for the tips on blocking. I have never blocked anything (guess I should since I will be pleasantly surprised and intend to on my granny squares) -- so I will find a way to get to this. I like the idea from Willow to block on a paper swaure cut outs that are pre-measured. Good idea! Especially when I will have around 65+ of the things to block! I need to get to that right away! 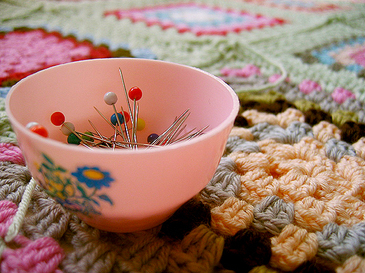 My Grandmother always made Granny Square blankets and other crocheted things. I was amazed at how much your fine work looks like hers did. Now I know she must have blocked her Granny Squares too. Thank you for the little teaching lessons here and there. Would you mind showing a granny square before blocking? I have heard that steam works for blocking when you don't have time to wet the item and let it dry. I actually use a clothes steamer to block cotton crochet squares. The steamer's nice because the piece seems to dry a whole lot faster. I haven't tried it on wool (some people are a little nervous about wool + high heat), but it works well for cotton. Hello, this is my first post on your site. Your work is awesome. 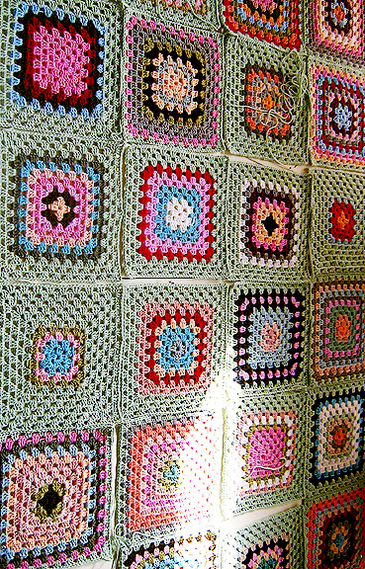 I crocheted grannie squares when I was 8. My grandmother taught me and she still makes blankets today she is 84. One question, what size hook are you using for these lovely grannies? Oh my, Alicia. What a lovely ball of furr!! She puts the kitty back in cat! I love the colors and your little granny squares are perfect after blocking. I love how the main color anchors everything. And I really like the ones that have a larger border. You eye bounces to them. You're making drop my needles and grab the hook. I should just change my name from earthchick to stalkerchick because I just can't quit stalking your granny square pictures. These are just fab. I love everything about every one you've made, and together they just look perfect. I'm in full-on granny square obsession mode. Your color choices are so bright and cheery! 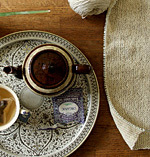 Blocking is like knitting magic -- all the wonkiness just disappears. As for a tip (I'm on the lazy and impatient side), I use the steam from my iron until it's slighly damp. It dries so much faster! Blocking acrylic is completely different though. A mere wetting absolutely won't do a thing. I knitted a lovely stole from acrylic and wanted it to drape. I steamed it, hovering the hot iron about 1½" over the surface for a bit, then moving on to another spot. If the iron touches acrylic, it melts it, so THAT isn't an option at all. One nice thing about acrylic is you block it once, ever. The drape stays in because you permanently change the character of the yarn with the steam. I bring this up because some making grannies may try to block their acrylic blankets like you're doing the wool, Alicia, and it's just not the same. I love your granny afghan. It looks so comfy and beautiful. Thank you for the tip on blocking, I have never even attempted it before, so this is a big help just in case I make one. Love the afghans (both the ripple & the grannie). You are inspiring a lot of people to start crocheting--including me. I love knitting, but have never had much interest in crochet til now! Also, since I know you are a fellow Ina Garten fan---there was a great article about her in the New York Times Business section on Sunday. You might be able to find it on line. If not, please email me and I will send you a copy. The article made me admire her even more because she has resisted efforts to give her whole life over to merchandising herself. She sounds just like someone we would all like to be friends with!! Alicia, I actually have a question about blocking. Instead of making several granny squares into a blanket, I am just making one big, giant granny square. So my question is, do you think I should wait until the end to block the whole thing or should I block it as I go? Any help you can give would be great. Your granny squares are coming along nicely. It really is a neat thing to watch as it all comes together. Oh my, another feast for the eyes! I can not tell you how much I have enjoyed watching your granny project unfold. I liken it to watching a flower opening up with colors bursting forth! Your granny blanket is sooo yummy! 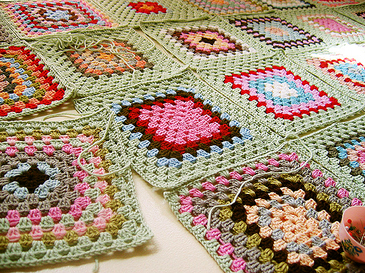 Love the granny squares that you are making. May I ask what yarn you are using and what size hook? 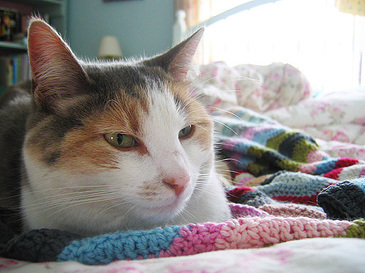 Your granny quilt is looking lovely and kitty does look ticked off! So I have a question about blocking - I just finished a sweater and it is out of machine washable/dryable cotton. So do I have to block it after every time I wash it? How does that work? I'm confused. Thanks in advance! Totally black, but a sweetheart. Your granny squares are so pretty. Also thanks for the blocking tips because I haven't had to block before because I've only been crocheting for a few months. How do you figure out how many squares you need? Thanks. I have never posted before. I discovered your site when reading my Romantic Homes magazines, and I so enjoy reading EVERYTHING and looking at your gorgeous photos! I was browsing eBay and saw an auction that just reminded me of thrift shop finds and your lovely pictures (#110103220779) - it inspired me to finally post just to tell you about it. We love so many of the same things, and I feel so inspired by you and your writing!! Your blanket looks amazing. Congrats! I've never blocked before and, as jennifer, I would like to see the difference. Could you please post pictures of before and after bolcking? Thanks!